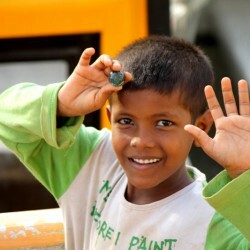 As the photo shows, Ashok loves playing and his favorite game is playing with marbles. Life was not easy for Ashok before he came here. Nothing is known about his parents, and Ashok and his little brother Satish were roaming the streets. We were notified about this and so gave them shelter. At first it was a bit strange for the brothers and they were somewhat withdrawn, but now they have made many friends and are becoming more and more forthcoming.